We are excited to announce a new exhibition at AccuQuilt. "Architexture": A SAQA-NE (Studio Art Quilt Associates of Nebraska) Exhibition is a brilliant original exhibition showcasing fiber arts. Architecture is a general term that not only describes man-made buildings but can also include the diverse structures found in nature. 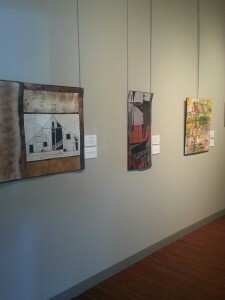 Combining this definition of architecture with the word texture, fifteen Nebraska area artists designed and created fiber artwork on a diverse range of topics including everything from the varied textures one finds in a home to the diverse textures of nature.